Earlier this fall, Lauren Young on our Network Team collaborated with companies across our portfolio network on our first-ever USV Network diversity and inclusion survey. One of the things we heard through our monthly USV Network diversity & inclusions discussions is that, while baseline metrics exist at larger organizations like Google, Facebook, or even Etsy, it’s hard to get a sense of where a 100-person startup might set their baseline. How are startups doing in terms of promoting diverse and inclusive work environments? What initiatives have been the most successful at rolling out a D&I strategy? Are there any patterns or trends we can expose within our network to share any best practices? What, if anything, can we do from our place as a VC firm to help? In the end, 38 companies* (just over 50% of our active portfolio) participated in this survey, with 55% of respondents falling between 31-100 employees. 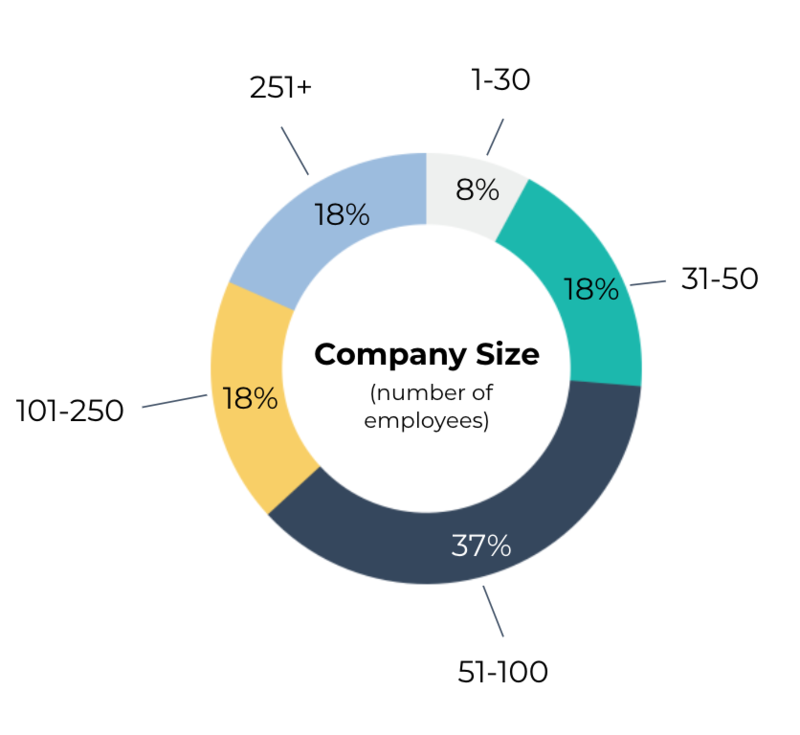 While this is obviously still a small sample size of startups, we wanted to share a few patterns that we noticed as well as share the survey questions that we asked among our network, in case you’d like to repeat this with your own portfolio or organization. Companies over 100 employees are most likely to have diverse executive teams. Of the 38 participating companies, 61% reported having women and 57% reporting having people of color* in the C-suite. While we didn’t ask about any further breakdowns (for instance, whether there is equal representation among men and women among these exec teams), we did find that companies with more than 100 employees were the most likely to have women and people of color in the C-Suite than smaller organizations. We did not survey on under-represented minorities, which we will fix in future surveys. There's an opportunity at the director level. Creating inclusive policies seems to be the most common first step. The most impactful changes come from deliberate, intentional effort. It's hard to find the time to make it a priority. One of the free responses questions in our survey asked about the biggest challenges our companies faced in order to get diversity right. 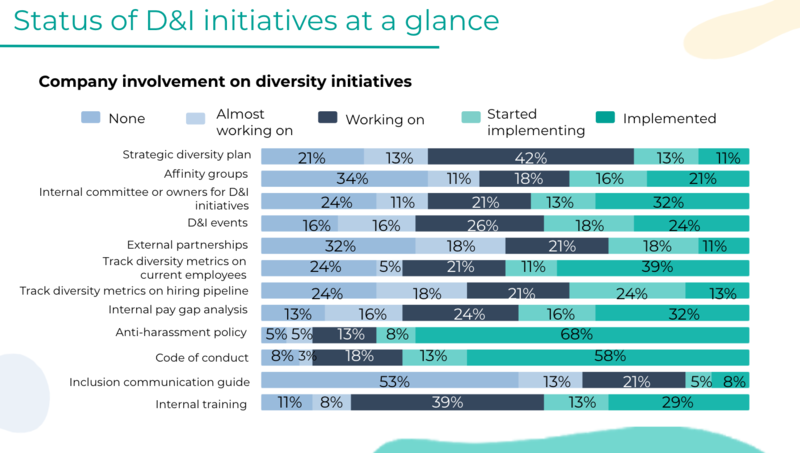 Some common answers we heard included building diverse candidate pipelines, integrating D&I into the organizational DNA, committing to spending time on D&I programs. There's a lot we can do as VCs to support this work. When we circulated these results internally at USV, we were most eager to explore how we can foster increased opportunities to amplify these efforts among our portfolio. A few great ideas emerged from this research for ways that our firm can help with recruiting efforts, building community, and offering cross-company training opportunities for our network. We intend to explore some of these ideas in 2019 and beyond. While we recognize that this survey is only an early step for us in better understanding the D&I needs for companies across our network, we hope that our companies and other communities can learn and build upon this work, too. To that effect, we’ve open sourced the survey questions that we asked to our network, including a few comments of places where we think we can improve in the future. We welcome the opportunity to continue collaborating with internal and external partners on this work. Special thanks to Kapor Capital, for collaborating on the question set for our survey, and to Jasmine Shells and the whole team at Five to Nine, an employee engagement solution that uses analytics to improve company culture, who helped us analyze these results. We received 38 total responses to this survey, representing just over 50% of our active portfolio at the time it was conducted (October 2018). The demographic breakdown of company sizes reflected in the responses is comparable to the overall breakdown within our active portfolio today. We defined “people of color” as a person of non-white or European descent and did not survey about underrepresented minorities, which was an oversight. In follow-up surveys, we intend to better understand how both populations are represented across the network.